Pittsburgh's offense has come alive on their three game winning streak, averaging a whopping 6.33 goals per game. They've done the bulk of the damage in the third period, netting 10 of their 19 goals in the final frame. The stretch was good enough for them to pull back into a tie with the New York Rangers for 1st place, but it featured some less than stellar play in their own zone as the team surrendered 10 goals in the three games, all Marc-Andre Fleury starts. It's a somewhat puzzling decision on Sullivan's part to start Fleury three straight games, given the poor season (0.900 SV%, 3.42 GAA) he's having while Matt Murray has been great, posting a 0.931 SV% and 2.01 GAA. Pressure has been mounting to trade Fleury since the expansion draft was unveiled and Murray established himself as the best goaltender on the team, and the recent stretch of play will surely fan the flames. The Florida Panthers also find themselves struggling more this season than they were the last, but unlike the Pens they don't have the luxury of finding themselves at the top of the standings while they work it all out. A year after surprising the hockey world in taking down the Atlantic Division title, the Panthers have fallen back to the pack this season. They've had some bad luck in the early going, as their 98.99 PDO in all situations ranks 24th in the league despite their 53.0 SACF%, good for 6th in the league. Bad luck, a let down from last season, or something else entirely, the Panthers weren't willing to spend time finding out and axed Gerard Gallant just 22 games removed from finishing 2nd in the Jack Adams voting at the end of last season. While Florida's defense last year (2.44 GA/gm; 7th) and this year (2.52 GAA/gm; 9th) has remained steady from a goal prevention standpoint, the offense has had much less success scoring goals this season, averaging just 2.33 GF/gm (26th) this season after averaging 2.83 GF/gm (8th) last year. The loss of Jonathan Huberdeau, who tied for 3rd on the team with 59 points last season, has hurt the Panthers so far this year, while other players have seen their offensive production tail off since last season. 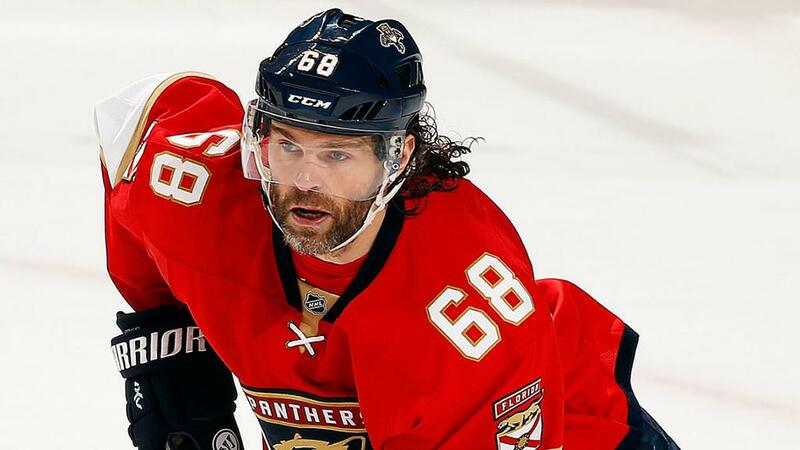 Jaromir Jagr has been an ageless wonder in the NHL, but he's struggled so far this season with just 13 points in 27 games after leading the Panthers with 66 points in 79 games last season. Aleksander Barkov had a breakout season last year with 59 points in 66 games played (0.89 pts/gm), and while he's second on the team with 17 points (5g, 12a) his scoring rate is well below where he was at last season (0.63 pts/gm). But while the team from last season has been struggling, Florida did make a couple of additions in the offseason who are paying dividends this year. Jonathan Marchessault put up 7 goals and 11 assists in 45 games last year for Tampa Bay, but after the Lightning failed to retain his RFA rights he signed with the Panthers on a two year deal, and he's already blowing by his numbers from last season in the early going. Through 25 games this year, he leads Florida with 10 goals and 19 points, setting new career highs in both categories. He's added a boost of scoring to the forward group, while Keith Yandle has helped provide offense to the blue line with 1 goal, 11 assists, and a 53.1 SACF%. - Bryan Rust netted a hat trick against the Senators on Monday, including a goal where he beat on a penalty shot. It makes him just the 2nd Pens players to record a hat trick and a penalty shot goal in the same game. The first? Mario Lemieux in his iconic 5 goals in 5 ways game.